ATTRIBUTES: Danburite is a spiritual stone carrying a very pure vibration activating the intellect and higher consciousness that link to the angelic realms. Danburite is an excellent stone for those who need to release stress and worry. Danburite helps one release grief, fear, anxiety, resentment or anger. The calming and soothing energies of Danburite resonant with the heart chakra allowing one to release anxiety and experience the calming sensation of knowing “all is well.” Danburite creates a sense of Joy and connection with the Divine. HEALING: Danburite is a very powerful healing stone. Danburite clears allergies, chronic conditions and has a strong detoxifying action. Danburite treats the liver, gallbladder, aids with muscular and motor function. Danburite regulates cell disorders, activates T-cells and the thymus, relieves Meniere’s disease, eases high blood pressure, and alleviates pain and migraine. Danburite may also be helpful in preventing heart attacks and in healing heart conditions. Dnaburite lessens fatigue and may help to overcome shock and trauma. 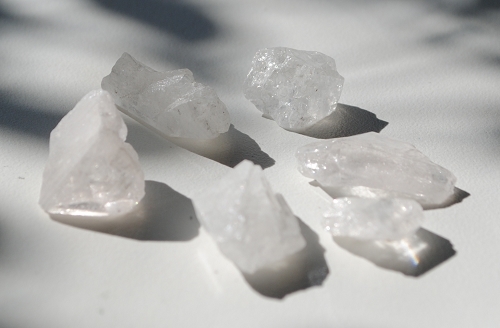 Danburite is a detoxifier, regenerating the liver and effective to overcome addictions and stress. Danburite may be used as an elixir for headaches and pain. PINK DANBURITE opens the heart and encourages unconditional LOVE of self. Used in meditation, Danburite takes you to higher state of consciousness and allowing access Divine inner guidance. Acting as a karmic cleanser, Danburite is a stone for facilitating deep change as one leaves the past behind. Danburite may be helpful for those who have difficulty sleeping, holding or placing a piece in your pillowcase will ease the mind chatter and relax the body. Placing Danburite on the bedside may accompany the dying on their journey beyond death, enabling a conscious transition to take place. In crystal body layouts or healing grids, Danburite clears and opens the crown chakra, linking and harmonizing with the heart. Danburite also activates and integrates the transpersonal and etheric chakras above the head, all the way up to the fourteenth chakra. Danburite aligns the heart chakra and clarifies the aura. The energy of Danburite combines well with Moldavite, Phenacite, Lepidolite, Amblygonite, Pink Tourmaline, Morganite, and Lithium Quartz.